Gangotri and Yamunotri are one of the holiest places where the rivers Ganga( or Ganges) and Yamuna, respectively originate. Yamunotri temple is perched in the western region of Garwhal Himalayas at an altitude of 3235 m (10,614 ft) whereas the shrine of Gangotri, is situated at an altitude of 3,200 mts flanked almost right opposite in the Bandar Poonch Peak (Altitude 3615M). 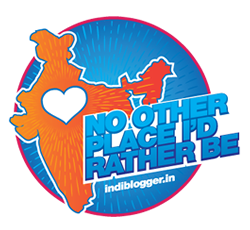 My wanderlust and love for treks had brought me to these wonderful destinations. 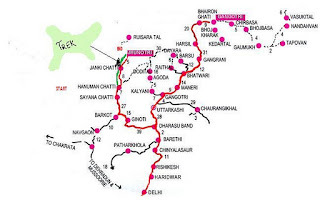 Gangotri can be reached by a motor able road right till the end through long winding roads. After having visited Gangotri, we decided to trek to Yamunotri. We arrived at Hanuman Chatti, which is on the foothills of ascent to Yamunotri. It was getting dark and we looked around for accommodation, as we had not booked in advance! With a bit of struggle we managed to get a place to stay overnight as the only state government owned hotel was not available. Beyond Hanuman Chatti, one has to trek an arduous, meandering, route 13 km long , to reach Yamunotri. 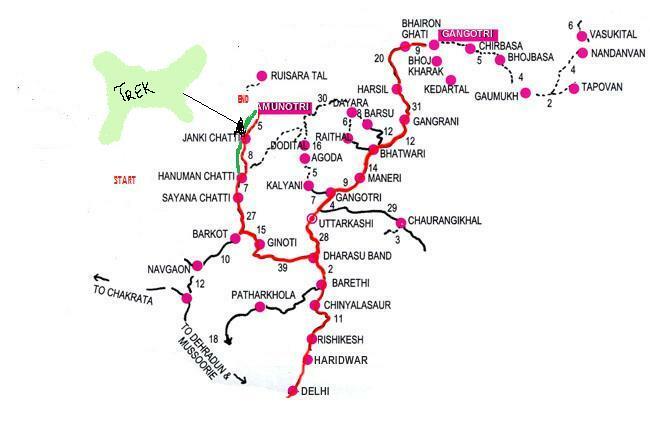 The attached map shows these locations including the trek route from Hanuman Chatti to Yamunotri. The weather was clear and the sun shone brightly as we commenced our trek the next morning. We had walked for almost four hours with a brief halts. My daughter who was eleven year old then, was bubbling with excitement! The winding route was strewn with boulders on either side. An occasional glimpse of the sparkling clean Yamuna flowing with gusto was a feast for eyes. In the backdrop were the snow clad peaks which appeared to be strewn with silver in the strong sunlight. The serene, tranquil surroundings, gurgling streams, occasional sighting of same rare birds, and dense alpine forests made for an ideal trek. There were relatively few trekkers here due difficult terrain. We stopped over to have a cup of tea at a small stall near Janki Chatti. The stall was erected on the overhang of the precarious mountain edge, raised about seven meters from ground level, with wooden planks. As, the tea was being prepared, there was a loud crash! I blacked out and descended vertically into a black hole for a few seconds! I heard shouts, and tried to regain my composure, to find my wife too following me! My feet hit the haystack on the solid ground below with a thud! She managed to hold on to the supporting wooden poles which were holding the wooden floor. I had fallen almost seven meters from the place where I stood a moment ago. I looked up, to find a gaping hole and my wife dangling just over my head. I assured her, as I grabbed her from the feet below. Our daughter, who miraculously held her ground, was hysterical. I assisted my wife to climb down to the bottom. We, fortunately sustained minor scratches and were otherwise unhurt! The wooden floor where we stood had given away leading to the crash! It was a miraculous escape. After the tea break we continued with the trek. The light was fading as darkness was slowly engulfing. It became very cold due strong winds. We often had to tread the cold water streams making our feet wet and very cold. To make matters worse, the climb was almost at an incline of 60 degrees for the last one kilometer leaving us gasping for breath! Then, suddenly, we saw the wonderful sight of frozen River Yamuna at a distance, from where the water trickled into a stream! We had reached in almost eight hours and soon found a small rest house to retire. It had been a very hard trek including a miraculous escape. At night it was freezing cold and despite sleeping bags and woolen blankets we could not sleep well. The next day we were rewarded with some rare breath taking spectacle of cascading Yamuna from the ice overhang. We visited the shrine, had a dip in hot water springs which was soothing, before commencing our descent! The locals cheered us when we reached the spot where the accident had occurred the previous day. The memories of this great trek remain firmly etched notwithstanding passage of time! Trekking is fun with friends and family and after reading the post i can imagine how wonderful the weather would have been. I am glad that you are safe and did not get any major hurt. I enjoyed your post as I always love to go for trekking. Its a great fun to go along with friends and family as well. Hope you all are fit and fine. It must have been a scary experience! Luckily you were all unharmed! It must be a great place to see though! Your trip sounded so scary, and with a 11 year old kid too. Well it is good to know you are all safe and enjoyed the trip. This is a true adventure my friend, and with your very young daughter? I am really amazed with your courage to taker her with you! Overall, I like the idea of your trip, I also dream that one day I can climb such historical places and spots, oh, I dreamed to be on the grand canyon! Thank you for sharing your real life experience my friend! Wow, that is some trip, and you have travelled immensely. With a child, you are very brave to have trekked :). This time there is no jealousy, Rahul. I have visited both Gangotri and Yamunotri when I was a kid. Would love to visit them again sometime. Trekking must have been wonderful. Oh, thanks for taking me on this trip with your story. I would love to go there. Must have a been a great view. @ Swati- Good to see you again! Thanks for that nice comment! 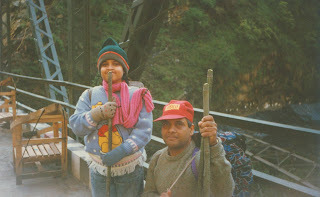 @ Babli- I always found thrill in treks! We are fine, thanks!! @ Shreya- Thanks for the concern! Treks have their own rewards and risks! @ Francesca- Sure it was worth it! @ Meera- So far all my outings are chalked out by me and never by organised tours! That adds to the excitement besides leaving you time to do things your way!You must visit, as these places have mystic beauty! @ PhilO- Thanks D:Yes these trips are fun, for sure..
@ Sujatha- Traveling at those altitudes is never too easy, but has fair share of fun..
@ Rama- Believe me , my daughter has accompanied me on every trip even when she was just a toddler and has learned much! @ Prime Aque- Thanks for your nice comment!It is fun to be out with family! @ Rachna Chabbaria- Thank god! :):) Will hopefully keep you amused with some more travel tales! @ Binu- Thanks for your kind remarks! Try to steal some time and enjoy..
@ Spiderdama- Himalayas have so much to offer! I can assure you, that you will surely enjoy.. It can be very scary when you are a part of it. But, Thank God you were all safe and had a great adventure. So true Saru! A providential escape and good fun when I look back..
trekking looks so good, but for me its almost impossible:).. I really love northern hills and all. Feel bad that you had a fall from the horse.. The lure of mountains is difficult to resist! Very beautiful and peaceful to be there in the Himalayas. You are lucky Rahul, I havent been there....but you are a travel freak arent you? @Alka - Yes indeed god has been kind to grant me this wish to travel all over!You are right that despite such amazing destinations, India has very poor infrastructure to en cash this opportunity! Thailand survives just on tourism! What a pity! From your descriptions, this location sounds so beautiful and placid. I'm not much of a 'trekker', but for a good view, I would go the extra mile (literally) Hope you're well after the fall. @ Sam-Thank you Sam, that I could make you feel to go on trek to this great destination. Am fine, thanks! Wow! This sounds like a crazy experience. Good to know it ended well. Now I want to visit this place too! Thanks Gayatri. It was a great trip!I just read your beautiful post! Thanks Kalai for iiking this..
Thankls Anand! Nature has so much to offer..